Operatives of the Anti-Kidnapping Unit of the Imo State Police Command have rescued an undergraduate of Madonna University, Okija, Anambra State, Esther Nnabuo, from her abductors. Onyekachi Chinemerem (23), of Isiala Ngwa of Abia State; Uchechukwu Nwakoma (36), of Isiala Ngwa of Abia State; and Onyewuchi Chibueze (27), of Mbaitoli, Imo State. The police also recovered the N200,000 the family of the 18-year-old paid for her freedom. The state Commissioner of Police, Dasuki Galadanchi told journalists on Thursday at the command headquarters in Owerri that the victim was rescued unhurt. The police boss said the handset used in the negotiation for the ransom was recovered by the command. The CP said, “Sequel to the kidnap of Miss Esther Nnabuo, operatives of the command swiftly swung into action. The victim is a student of Madonna University, Okija, Anambra State. She was abducted at Ukwo Orji, in Mbaitoli LGA. “In the course of investigation, the victim was rescued unhurt through intelligence and data tracking analysis at Ukwo Orji Forest. 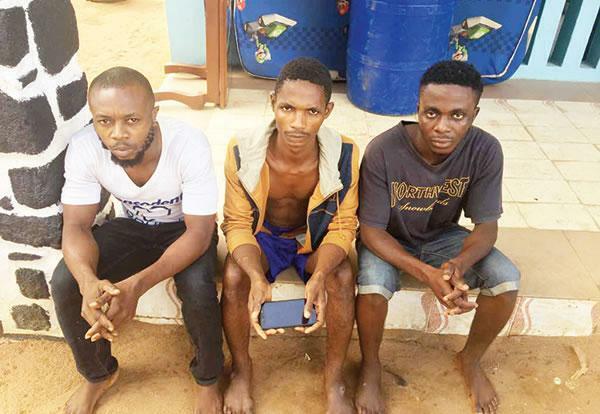 Three suspects were arrested, while the victim’s telephone and the ransom were recovered. The CP said the suspects had made confessional statements and would be charged to court accordingly.